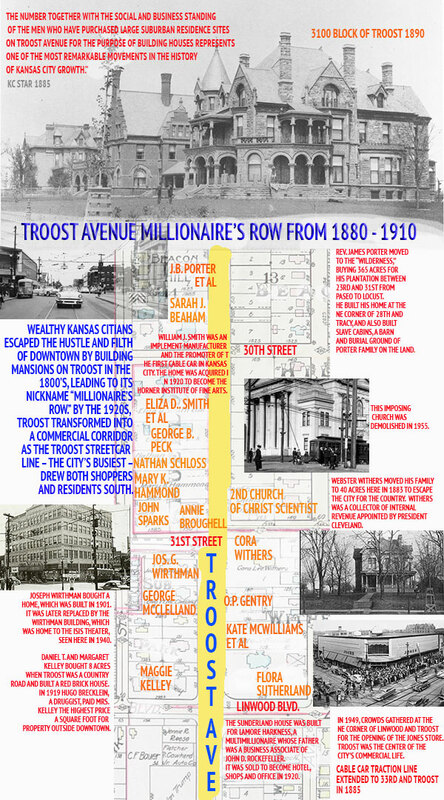 It is history day at the Midtown KC Post, and we’ve got a new map that shows how Troost Avenue changed in the years between 1880 and 1920, transforming from millionaire’s row into Kansas City’s premier shopping street. The best way to see the transition is by studying old maps of 29th to 32nd Streets and Troost. The map below is based on a 1907 property ownership map of Troost, when most of the great mansions built in the 1880s still stood. You will notice from the names of the property owners that the male businessmen had in many cases died, and the property was then owned by their wives. By the 1920s, as residents move south and the Troost streetcar followed, the mansions were replaced by a thriving commercial shopping district where everyone in Kansas City went to find the latest goods. As part of our Uncovering History Project, the Midtown KC Post is taking a look at the 1940 tax assessment photos of each block in Midtown. This week, we’re taking a break to focus on how the blocks from 29th to 32nd and Troost changed over a period of 40 years. There’s still a lot more to learn. Do you remember this block? What special memories do you have of this section of Troost? What questions do you have about it? Let us know and we’ll share your history and help to preserve it on our website as part of our Uncovering History project. If you are interested in history, you might like Midtown KC Post editor Mary Jo Draper’s new book Kansas City’s Historic Midtown Neighborhoods. All photos courtesy Kansas City Public Library, Missouri Valley Special Collections. Working at Best Deal gives me the opportunity to see these old buildings up close and personal. The architecture is wonderful at times and puzzling at others. But you can come see for yourself! This area is being revitalized, stop in at Best Deal at Linwood & Troost and talk to Ben! sights can be realized on Troost once again. I thought the Jones Store was at 31st & Troost and Firestone was at Linwood & Troost. It’s been years since I’ve lived in that area so I could be mistaken. I thought Operation Breakthrough was located at the old Jones Store on Troost.